This entry was posted in Ask For Evidence, Chemistry in the media, Everyday chemistry, Food, Medicine and tagged ALA, ask for evidence, chia seeds, DHA, EPA, fatty acids, flax, flaxseed, oily fish, omega-3, wayne coates by katlday. Bookmark the permalink. I enjoyed reading your article and i like chia seeds and its benefits! i actually recently wrote an article about the health benefits of chia seeds and the different ways we could add it to our daily lives without changing our routine or meals completely. Hi, have you actually read my article? Good article. It’s a relief to find something to read that’s based on fact. Thank you! A better source of DHA omega-3 for vegetarians–albeit an expensive one–is algal oils. Those oils are the things the fish get their oils from. They are available in supplement form. Thanks for the fun and easy to read article. Your articles are very well thought out! I was using flax seeds in smoothies and recently heard humans receive only a little bit of the benefits from omega3s in plants. Your article broke down everything i wanted to know in detail and saved me a lot of time! You also cite your sources so that I didnt have to browse through all those marketing websites for information i wanted! I have been using chia seeds for about 5 years and found that they do a great job at hormonal balance and reducing inflammation. In addition, we call them happy food because of the way they feed your brain. We use up to 2 tablespoons each day. Try it and see if you don’t feel happier! Great info! Thanks so much! Saved a ton of reading! I’m anemic, and I just was researching chia seeds because I just bought some new snack bars, and realize that along with nutrients, they contain chia seeds. Do you think if I eat these throughout the day, along with my iron supplements, they’ll block the iron? The tablets are hefty, at 325 mg, (as I said, I’m pretty anemic). Thanks. To be honest, I don’t know. Best to check with a GP or a dietician (dietician not nutritionist; nutritionists are not necessarily qualified). My feeling is that it would be unlikely to cause a problem, as the absorption problem relates to absorbing nutrients from the seeds. I wouldn’t have thought they would affect tablets taken at a different time, but I’m not an expert on this. Thank you so much for your reply. I’ll put it on the list for my GP. 😊 I’ve found there’s much controversy around such a tiny seed. Perhaps I’ll just avoid them? Are they an occasional part of your diet? They absolutely block iron absorption. I was taking iron everyday , i have been iron def anemia for almost my whole life , thought I had it under control , until I started taking chia seeds in a breakfast shake I was making . It stopped all absorption and left me in a very critical place with my anemia. Its best to avoid them if you can. Same with flaxseed. Try taking a teaspoon full of blackstrap molasses, and do your own research on nutrition. Chemists, and most doctors, are required to take very few hours of nutritional education. There are reasons why animal products are consistently among the most unhealthy foods and plants are consistently the most healhty. I have. Properly qualified dieticians universally recommend a balanced diet. Animal products provide lots of useful nutrients. It’s all about balance and moderation. When I initially left a comment I appear to have clicked on the -Notify me when new comments are added- checkbox and from now on whenever a comment is added I recieve 4 emails with the exact same comment. There has to be a means you can remove me from that service? Thanks a lot! Hi, I don’t believe I can. Do you have a WordPress account? If so, try logging in and checking your notification settings. Otherwise, best thing might just be to filter the offending messages from your mailbox. Sorry about that! Look at your Blogs I Follow page and see if you’re still set to receive emails on the sites you follow. To disable email updates from being sent, you’ll need to click the Edit button next to each site, and then click “Off” underneath “Send new posts by email” – as you can see in this screenshot. I researched your conclusions that ALA does nto have any health benefits, except for when it is synthesized into DHA and EPA. I think that your conclusions are wrong. There are sources that say that ALA has health and anti-inflamatory benefits, without being synthesized into DHA and EPA. does’t say that ALA doesn’t have health benefits. on the contrary. but it says that DHA and EPA have much more research done on them. so maybe when we will have more ALA research, we will see that it has as much benefits as DHA and EPA. SO, what’s your opinion ? Where have I concluded that ALA doesn’t have health benefits? My point was that DHA and EPA are essential fatty acids, with important health benefits, that all of us need to consume because we can’t synthesise them in our bodies effectively. Chia seeds are a good source of ALA, but not of DHA and EPA, so in my opinion it’s misleading to compare chia to, say, salmon. There is a UK study that shows humans do convert ALA into EPA and DHA just as vegetarian animals do. It also shows that blood levels of vegan and non fish eaters are on par with heavy fish eaters. Heres the link that references the study and a quote. Despite having significantly lower intakes of EPA and DHA (from fish or fish oil), blood levels of EPA and DHA in vegans and vegetarians were approximately the same as regular fish eaters. The results indicate that the bodies of vegetarians and other non-fish-eaters can respond to a lack of dietary omega-3 EPA and DHA by increasing their ability to make them from omega-3 ALA.
None of this should be taken to mean that plant-based sources of omega fats aren’t useful as part of a healthy diet, because of course they are. However as things stand, this research doesn’t (yet) provide conclusive evidence to disprove the notion that fish and fish oils aren’t the most efficient source of EPA and DHA. 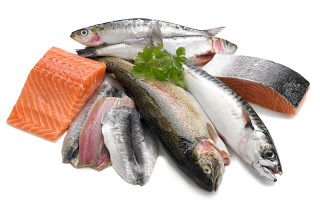 Unless you have good reason not to eat oily fish, it’s still probably a very good idea to include it in your diet. The article was very explicit on the ALA, sources and DHA found best in oily fish, and identified the false claims made with chia seeds. I was using the wrong information for a year, so thank you for giving a detailed account without forcing me to browse through too many marketing sources. The additional research sources on Ala are also helpful. The information in this article reinforces a valid source for ALA and DHA arguments for maintaining a healthy retina (prevention of AMD), building more cells for better neural pathways in the brain, and maintaining a healthy skin. Thank you, and the additional comments listed were similar to mine. Also, there is a lot of good research suggesting that the ALA may be important partially for the chelating effect. I thought the EPA an DHA had to get converted to PG3 whereas the ALA didn’t. Am I confused? Hi, sorry I’m not totally sure I understand what you’re saying? My point in the article was only that chia seeds are not a good source of EPA and DHA, so comparing them to oily fish could be seen as rather misleading. Hi! I don’t find yet a good source of omega-3 in plant-based diet. This problem makes me nerves as hell, because I’m vegan ..
How do you think, am I really need to take a supplement (vegan) or there is some food, that can provide me enough DHA? p.s: i’m sorry, if I wrote unclear. I’m not a native speaker..
A vegan supplement will probably be the easiest and most effective way. It is a struggle if you don’t eat fish. I’m vegan too. You can now get vegan algae oil Omega 3 supplements which have EPA and DHA, such as Opti3 in the UK. (The same manufacturer makes a vegan Vitamin D3, which is also quite a new thing.) I’ve been using them for years and notice they make a difference to my periods and my dry eyes. Check out NutritionFacts.org and search for omega-3 or flaxseed. The nutritional studies reviewed indicate that ground flaxseed is the best plant-based source of omega-3 fatty acids as of now. i was looking at chia seeds as a source of fiber when i found your article, which, made it so easy to figure out what is what about epa, dha and ala and how they work; thanks for that. i don’t know if you have the answer (and i’ll keep searching for answers), but my doc has me taking fish oil supplements for my cholesterol, and i need fiber for my gut issues and chia seems to be chock full of fiber. i’m not much of a fish eater either – working on that. any info on taking these two together; benefits? I find chia seeds work great for my bowel movements regardless of whatever else is in them and they make me feel full for a lot longer when taken with a meal. I started taking them as a source of soluble fibre to treat diarrhea but I guess I was taking too much. I started to have lots of nosebleeds which I had never had before in my life as well as gum bleeds. I would be spitting out blood every time I brushed my teeth or had a tissue full of blood whenever I blew my nose. As soon as I scaled back to just a tbsp a day, the bleeding issues went away along with some of the benefits for my bowel movements. You can’t win I guess. Hi there. This is an interesting article. I was wondering, though, doesn’t the phytates break down after soaking the chia seeds just like it does after soaking and cooking beans? If not, I wonder if the health benefits of chia seeds would become greater if they were grown into micro-greens instead of just eating them like a pudding. Your thoughts? I’m not an expert on this, but I believe you’re right, yes: cooking and sprouting will reduce the phytate content and therefore make the nutrients more absorbable. Chia is usually sold to be eaten raw, though. As the earlier commenter mentioned about soaking the seeds : I had read that soaking makes the nutrients more available. I drink my chia seeds with a bit of juice… mostly for the fiber benefits. Looks like I need to find an omega3 supplement as well. Thanks for a non biased, easy to understand article! I sprinkle one tea spoon on my toast every morning, thinking is good for my skin because I don’t eat much fish, we live in the mountain and its so expensive, and fish oil is very expensive too. Do you think I should stop having them? or it has some benefits for me? great article! Well, as I’ve said before I’m not a dietician! I’m sure chia has some benefits, just maybe not quite the ones you’ve perhaps been led to believe. what happens to the phytates when the chia seeds are soaked overnight? Also, I have noticed that chia seeds are now sold with probiotics added. I would like to see a study that measured the phytates in soaked chia seeds. I don’t know a lot about this, but I believe that soaking them in an acidic solution (water and vinegar, say) can help to break down the phytate. So that might help, yes. Why bother with the chia seeds at all if you’re going to take fish oil? Hi! I don’t know much (i.e. anything really) about skincare! Dermatology is a complex area. From what I understand, virtually nothing you put on your skin is absorbed to a depth where it will actually have any effect. Moisturisers can produce a temporary plumping effect – which can make wrinkles seem less obvious for a short while – but that’s all. So I think you’re right to be dubious. But on the other hand, if you like it, and your skin seems to respond well to it, and you can afford it, then why not? Unless you have a medically diagnosed skin condition (e.g. psoriasis) I think moisturiser is one of those things, like shampoo, makeup, perfume etc, where it simply comes down to personal preference. Great, thanks for the response! This pretty much confirms what I have managed to find out so far, which is that you should just go for the cheapest product that you like because nothing really “works”! It would be interesting to see if ALA to EPA and DHA conversion can actually work on the very long term. So, we know that if you just bump the ALA intake, you won’t get enough EPA and DHA because the efficiency of conversion is quite low. But then we have many kilograms of body fat and quite large fraction of that would be in the form of ALA if we would get most of our fats in the diet from whole foods like walnuts, chia seeds, flaxseeds, and also leafy vegetables, instead of cooking oils. With many kilograms of ALA in your body, the low conversion rate to EPA and DHA could be enough. Evolution should have led to a robust body design that can cope with fluctuations in the diet that one can expect to happen in Nature. So, it would be strange if it tuned out that we really need to eat fish regularly to meet our demands for EPA and DHA. It’s a priori far more plausible that the problem with getting enough EPA and DHA has to do with unnatural aspects of our modern diet, our use of cooking oils is then a suspects that should be investigated. Yes, it would be interesting – it would require quite a long term study, though. One thing, though, Europeans in particular HAVE historically eaten a lot of fish in their diets. Likewise Asian countries. So humans have evolved with fish and seafood as an integral part of our diet.